The rear end of this silver orb weaver resembles a fiendish creature. Can this confuse a predator or deflect a lethal attack away from the spider’s head? Last week we met industrious Mariolas, stingless bees with clever defenses to foil raiders of their golden honey. While watching the fascinating antics of Mariolas in residence in the hollow of an ancient tree, we spotted the gossamer web of an opportunistic orb weaver we believe to be Argiope argentata just below the nest. Sure enough, the spider had snared several Mariolas in its web. Just below a nest of stingless bees a silver orb weaver has set up shop. Careless bees face a gruesome end. Watch as she snacks on a hapless bee. This beautiful and rather large orb weaver ranges from the southern United States to distant Argentina. It is kin to the black and yellow garden spider and spotted orb weaver we met in previous episodes. Orb weavers belong to family of spiders known as Araneidae, made famous by E. B. White in his classic tale Charlotte’s Web. You may recall that Charlotte used her web to write eloquent praises for her friend Wilbur in an attempt to rescue him from becoming a porcine feast for farmer John. 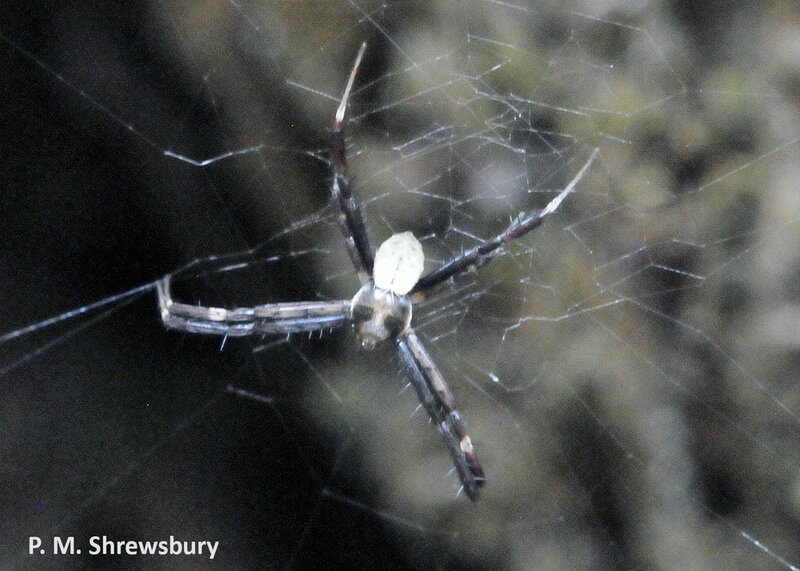 Unlike Charlotte, most silver orb weavers are influenced by Robert Louis Stevenson and Treasure Island and they form an “X” in the center of their web. Yes, “X” marks the spot where treasure is buried or, in the case of the silver orb weaver, where the spider rests. Unfortunately, our Costa Rican orb weaver was slightly dyslexic and could only muster an inverted letter “Y” in the center of her web. A tiny male silver orb weaver hides in the web a safe distance from his mate. Spider experts call this band of heavy silk in a spider’s web the stabilimentum. The function of the stabilimentum is a topic of debate among arachnologists. Some suggest that the band helps disguise the spider from its predators by providing a form of camouflage as the spider rests in the center of its web. Others believe that the stabilimentum may act as a tiny parasol shielding the spider from intense rays of the sun. One fascinating study revealed that the conspicuous bands of silk acted as a visual warning to low flying birds, thereby reducing the likelihood of devastating web-destroying crashes much the same way an image of an owl on a large plate glass window dissuades misguided birds from crashing and breaking their necks. Of course, the spider cares not for the welfare of the bird, but repairing bird-damaged webs takes time away from important projects like capturing and eating insects. Although we tried to resist poking this web, our curiosity got the better of us and slight digital inquiry provoked a remarkable behavioral display. The silver orb weaver began to rhythmically flex and extend its legs. These gyrations set the entire web rocking back and forth in ever-increasing waves. Swaying the web in rhythmic motion is called web-flexing and it is often observed in orb weavers. Web-flexing has been reported as a way to dislodge potential predators or overly large damage-causing prey that become entangled in sticky capture-threads in the web. Flexing may serve other defensive purposes as well. Enemies of the orb weaver include predatory lizards, toads, and other spiders that rely on keen eyesight to locate and capture prey. In an interesting treatise on orb weavers, researcher Wayne Tolbert suggested that web-flexing might be a clever way for the spider to conceal its exact location, thereby confounding hungry predators. Clearly, the old adage location, location, location well describes how this clever predator has set up shop near a seemingly endless supply of stingless bee snacks. A slight disturbance with a finger sends the silver orb weaver into paroxysms of web-flexing behavior, first at full speed and then at half speed. Sure makes me dizzy. Bug of the Week thanks spider expert Jeff Shultz for helping to identify this week’s star. 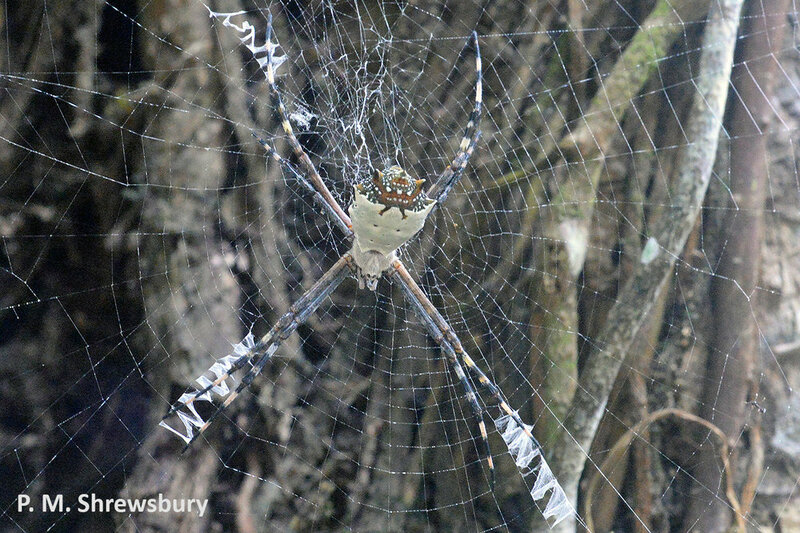 Dr. Shrewsbury provided images of the silver orb weaver and risked an encounter of the arachnid kind by poking the spider web. Two great articles “Predator avoidance behaviors and web defense structures in the orb weavers Argiope aurantia and Argiope trifasciata” by W. Tolbert, and “Do stabilimenta in orb webs attract prey or defend spiders?” by T.A. Blackledge and J.W. Wenzel, were consulted for this episode of Bug of the Week.